My homemade chocolate-almond toffee is the perfect gift for that annoyingly slim friend, preschool teacher, housekeeper, co-workers, weird uncle, nosy neighbor and all those other hard to shop for people in your life! I mean, seriously, what else can you buy for under $20 that they will actually enjoy? Toffee also makes the ideal wedding favor. It's something your guests will enjoy (so much better than breaking a tooth on Jordan Almonds!) and I can help you customize the label with your names, date and photo/image of your choice! For no additional charge, I will work with you to create custom labels with your photo or holiday motif - make it witty, silly, serious, religious, bitter, sweet, pathetic, naughty or nice! Chocolate-almond toffee comes in white, milk or dark chocolate or any combo of 2 - 3 types! I sell $30, $15, $10, $7 and $5 boxes of toffee - something to fit every budget! 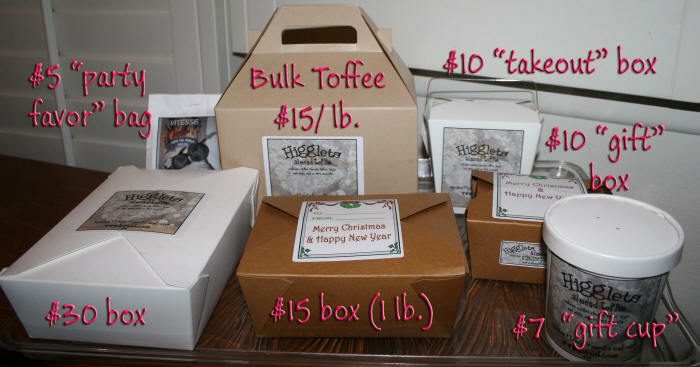 I also sell toffee in bulk for $15/pound... it is a fabulous treat that you can keep in the freezer for months!